I took some time off on Saturday from setting up my Chesapeake Fish Camp and Wavewalk friends and family demos to make a run to Mallows Bay on the Potomac River. In this shallow cove, resides the largest shipwreck graveyard in the Western Hemisphere. There is a beautiful park and public boat launch. 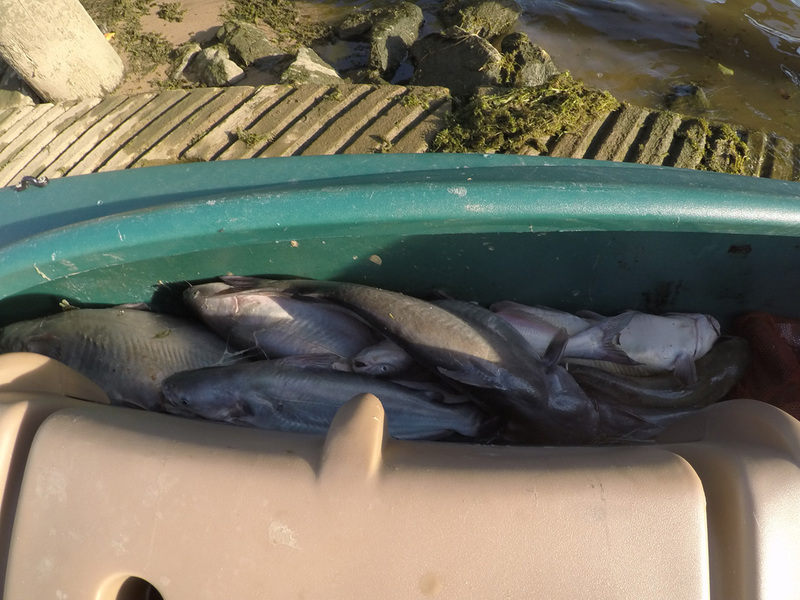 Though the catfish are spread out in the river and up the creeks, you can still catch a mess of catfish if you fish the right tide with the right bait. The four way removable PVC spreader rod holder rig / anchor line cleat helps put enough baits all around the boat to tickle their whiskers. 8 Blue Cats and 3 Channel Cats did not come close to loading up the W700. But, they will make a fine fish fry. Looking forward to summer Wavewalk adventures in the Keys. 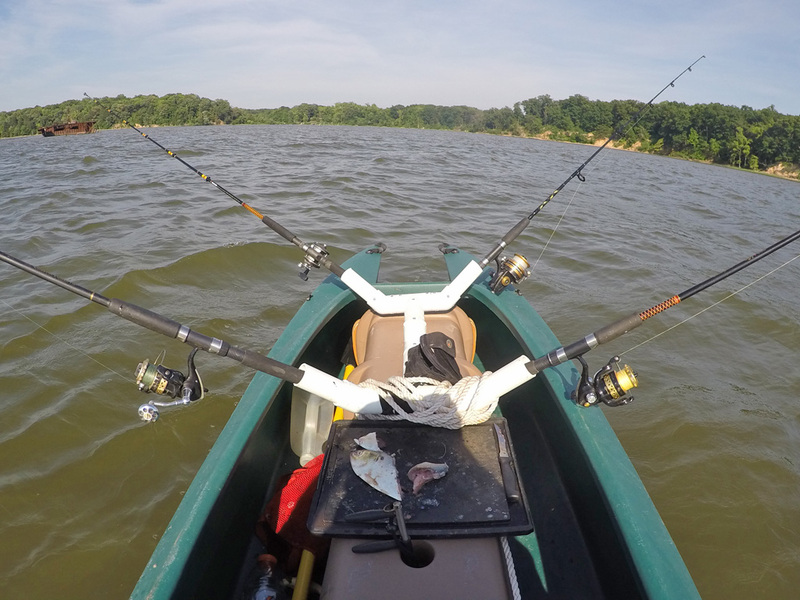 Hey, Larry……what do you do when all 4 rods get action at the same time? 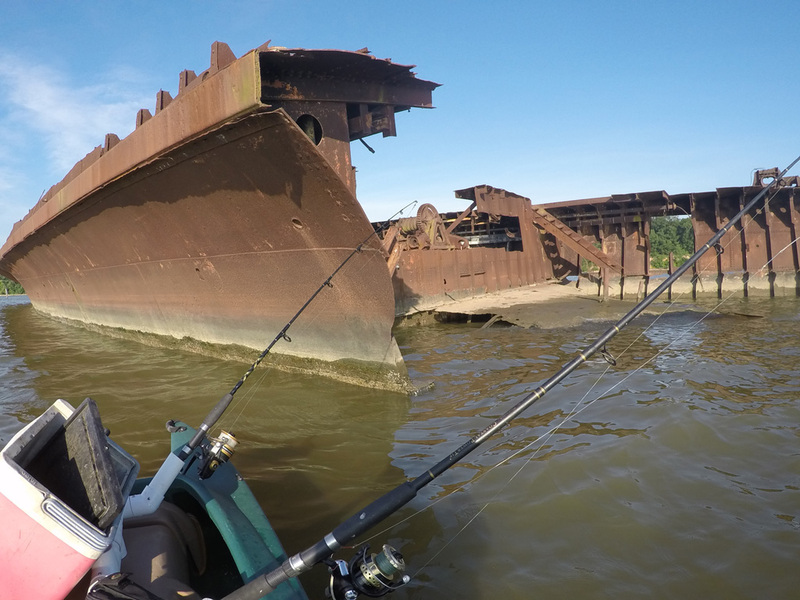 That scenario is what I enjoy about fishing the Potomac in November. The scenery is beautiful but there is little time to appreciate it as the big Blue Cats are slamming the baits and, usually. hooking themselves. The fish have been driven out of the creeks by the cool weather and are fattening up on Mud Shad along the edge of the river channel. Mostly, I try to get in the shortest line first and work one by one till the last and longest is in. Then, bait up, and get ready for the next round. Blue Catfish are voracious predators that run in packs with the moving tide. They are considered invasive in Maryland. But, they are both fun to catch and good to eat. Now that’s a fish fry!!! I love your rod holder set up.